Get valuable tax information directly from a licensed CPA. Access to a growing database of questions and answers from people just like you. Find a local accountant instantly to assist you with your tax questions. 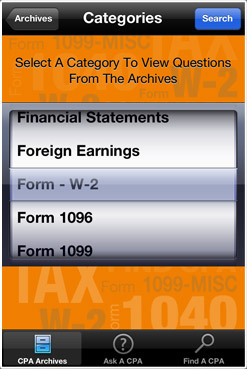 Search the "ASK A CPA Archives" by category to find your answer instantly. 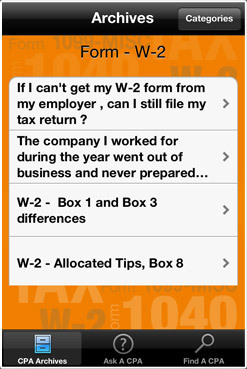 New questions and answers are added to our answer database daily without the need to update your App, so you will always know that you are getting access to the most current tax information. If you don't find your answer you can "ASK A CPA" your question. 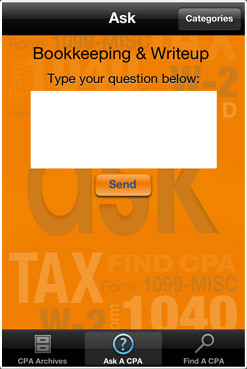 Answers will be provided FREE directly from a CPA in your area. Need more help? You can find a CPA near you easily simply by entering your zip code to gain access to our expansive CPA network. Latest Tax Changes,401(k),Adoption Expenses, Alimony, Alternative Minimum Tax, American Opportunity Credit, Armed Forces tax info,, Bonus Depreciation, Bookkeeping, Business Startups, Buying & Selling a Business, C Corporations, Cancellation of Debt, Capital Gains, Car & Truck Expenses, Casualty Losses, Charitable Deductions, Child Card Expenses, College Costs, Corporate Tax rates, Day Trading, Deceased Taxpayers, Defined Benefit Plans, Dependents, Depreciation, Dividends, Divorce & Marriage, Earned Income Credit, Educational Tax Benefits, Estate Planning, Estate Tax Rates, Estimated tax payments, Exemptions, Filing Status, Financial Statements, Foreign Earnings, Gambling Winnings, Gifts, Head of Household, Hiring a CPA, Home Office, Household Employees, Health Savings Account, Incorporation services, Independent Contractors, Innocent Spouse, Insurance, Interest, Investment Planning, IRAs,Itemized Deductions, Job Costs, Keogh Plans, Kiddie Tax, Late Filing Penalties, Lifetime Learning Credit, LLCs, LLPs, Losses, Married Filing Separately, Medical Expenses, Mileage Rates, Minimum Wage, Miscellaneous Income, Mortgages, Moving Expenses, Mutual Funds, Partnerships, Passive Activities, Payroll Taxes, Probate, Property Taxes, Rental Expenses, Residence, Residential Energy Credits, Retirement Plans, Roth IRAs, Self Employment, SEP IRAs, SIMPLE IRAs, Small Business, Sole Proprietorships, Schedule C, Standard Deductions,Standard Mileage Allowance, Student Loans, Sub S Corps, Tax Rates- Individuals, Travel & Entertainment, W-2, Where's my refund? Where and How do I File? CPAs - Want to get listed?